So much for Apple's voice command/response technology Siri. Among this year's holiday presents, our family received a gift card for Italian eatery Buca di Beppo, which my daughter gladly used to go out to dinner with a friend. So last night, they're ready to drive but no one knows to where. She pulls out her iPhone 4S and speaks "directions to Buca di Beppo", which Siri can't understand and repeatedly gives meaningless results when she tries again. Oh, this is too good an opportunity to pass up -- Android vs iPhone in the Wilcox household. I grab Galaxy Nexus, which my daughter sees and changes tactics: "Italian restaurants, downtown San Diego". There are zillions, because of Little Italy. I speak, just one time: "Directions to Buca di Beppo", wondering if I'll get no better response. Text "directions to Buca di Beppo" pops up as confirmation and then Google Map showing the way from our apartment to the restaurant. Apple's Siri marketing may be better, but Androids have had voice search capabilities for much longer and it shows -- see my earlier test about that. 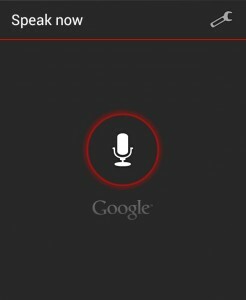 Google leverages search, too, something that even Siri asset Wolfram|Alpha can't match. But there's more: In my early use of Galaxy Nexus -- hey, I've only had it 16 days -- voice capabilities are better than on other Androids. It's not just Android 4.0 but the whole package. Galaxy Nexus doesn't feel like an OEM product. There's tight integration everywhere and on the software side closely with existing Google services. Days before Galaxy Nexus' US release, Android and Me dropped a juicy rumor -- that Google is working on a Siri-like product codename "Majel". Trekkers will know that Star Trek creator Gene Roddenberry's wife, Majel Barrett, was the computer voice in the original series, spin-offs and movies. What really differentiates Siri from Google's already great voice capability is the interface -- that female voice responding to the user. Before writing here, earlier this morning I posted a shorter version on Google+, where Eli Fennell responds: "People were already using Google Voice all over the Apple products, and for Apple, that's not good. If Google Voice is already better, or at least an equal who may not have natural language support but is damned good at understanding what you said and converting it into a search string to be processed by their epic algorithms, then how badly will Majel embarass Siri when it arrives?" The Apple fans among you will call my "Buca di Beppo" face-off as unfair, since one test isn't representative of anything. Actually, it means everything. Because this is exactly the kind of voice search many people will do when out and about. Also, I've done this kind of testing before, where search on Galaxy S II Skyrocket (running Android 2.3.6) handily bested my daughter's iPhone 4S Siri.